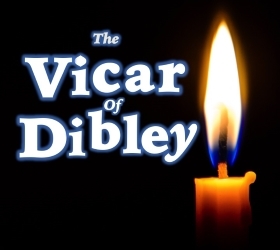 Everybody’s favourite Vicar returns to the 1812 stage this November in 3 New Episodes of the classic BBC TV series ‘The vicar of Dibley”. Our stage version of this hilarious, yet heart-warming BBC TV sitcom features all the eccentric, lovable characters, including Alice, the blonde, dippy verger; Owen, the earthy, local farmer and the stuttering Jim who prefaces most remarks with no-no-no-no-yes! And, of course, there’s the inimitable vicar herself. The script is by Richard Curtis and Paul Mayhew Archer, writers of Blackadder and Mr Bean; and being performed this season are the episodes ‘Window & Weather’, ‘Love & Marriage’ and ‘Winter’. Don’t miss this unique opportunity to see 3 episodes of The Vicar of Dibley live on stage in one show.